You can only deduct gifts you give to qualified charities. The IRS has a tool on their website called Select Check that will confirm if you the organization you want to contribute to is qualified. You can deduct donations you give to churches, and government agencies. This is true even if does not list them in the Select Check IRS Database. Gifts of money include those made by: cash, check, electronic funds transfer, credit card or payroll deduction. You must have a bank record or a written statement from the charitable organization to deduct any monetary gift on your tax return. This is true regardless of the amount of the gift. For Payroll Deductions you should retain either a pay stub, Form W-2 Wage Statement, or other documentation from your employer. It must show the total amount withheld for charity, along with the pledge card showing the name of the charity. Household items include furniture, furnishings, electronics, appliances and linens. If you donate clothing and household items to charity they generally must be in good condition to claim a tax deduction. If you claim a deduction over $500 for an item, it doesn't have to meet this standard if you include a qualified appraisal of the item with your tax return. You must get an acknowledgement from the charitable organization for each deductible donation (of either money or property) of $250.00 or more. Additional rules apply to the statement for gifts of that amount or more. This statement is in addition to the records required for deducting cash gifts. However, one statement with all of the required information may satisfy both requirements. 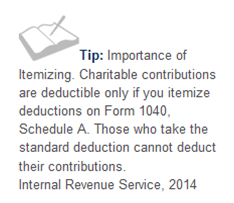 You must deduct contributions in the year you make them. If you charge your gift to a credit card before the end of the calendar year, it will count for that year. This is true even if you don't pay the credit card bill until 2015. Also, a check will count for the calendar year as long as you mail it in that same year. 1. Know The Limits: You can contribute up to a maximum of $5,500 ($6,500 if you are age 50 or older) to a traditional or Roth IRA. If you file a joint return, you can your spouse can each contribute to an IRA even if only one of you has taxable compensation. In some cases, you may need to reduce your deduction for traditional IRA contributions. This rule applies if you or your spouse has a retirement plan at work and your income is above a certain level. You have until April 15, 2015 (of the current year) to make an IRA contribution for the previous year. 2. Avoid Excess Contributions: If you contribute more than the IRA limits for the year, you are subject to a six percent tax on the excess amount. The tax applies each year that the excess amounts remain in your account. You can avoid the tax if you withdraw the excess amounts from your accounts by the due date for your current year tax return (including extensions). 3. Take Required Distributions: If you are at least 70 1/2, you must take a required minimum distribution, or RMD, from your traditional IRA. You are not required to take a RMD from your Roth IRA. You normally must take your RMD by December 31, 2014 (of that tax year). That deadline is April 1, 2015 (of the the following year) , if you turned 70 1/2 in 2014. If you have more than one traditional IRA, you figure the RMD separately for each IRA. However, you can withdraw the total amount from one or more of them. If you don't take your RMD on time, you face a 50% excise tax on the RMD amount you failed to take out. ﻿﻿4. Claim The Savers Credit:﻿﻿ The formal name of the saver's credit is the retirement savings contribution credit. You may qualify for this credit if you contribute to an IRA or retirement plan. The saver's credit can increase your refund or reduce the tax you owe. The maximum credit is $1,000, or $2,000 for married couples. The credit you receive is often much less, due in part because of the deductions and other credits you may claim.